With this being the first race for the NASCAR Camping World Truck Series (NCWT) at Canadian Tire Motorsports Park (CTMP), some drivers are trying to get the upper-hand and get some extra laps on the track versus their competition. NASCAR has arranged four practice sessions in total before the race for the truck regulars, but there’s a four-some that are looking for more. 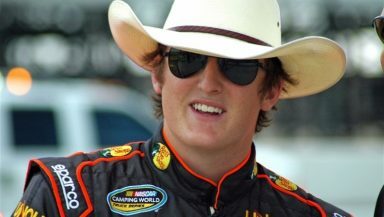 Ty Dillon, James Buescher, Jeb Burton and Chad Hackenbract are all entered in the NASCAR Canadian Tire Series Pinty’s presents the Clarington 200 at Canadian Tire Motorsports Park this weekend. The NASCAR Canadian Tire Series practices and qualifies alongside truck practice and qualifying on Saturday. Then on the Sunday, the NCAT race is run prior to the NCWT race. Beyond getting some laps, though, these drivers will be looking for the win as they will be running in top-tier series equipment. For Ty Dillon, he will be running the No. 4 for Fitzpatrick Motorsports for the second time this season. Dillon ran the car earlier this year in May and came home with a solid seventh place finish. Dillon is one of the drivers that enters the weekend with some road course experience due to the ARCA Re/Max Series experience. Fitzpatrick Motorsports currently houses the No. 84 Equipment Express Chevrolet for J.R. Fitzpatrick and Fitzpatrick is the all-time leader in race wins on the road course with three. James Buescher will be driving the No. 24 Dodge for 22 Racing as a teammate to Scott Steckly in his Canadian Tire Series debut. When Buescher’s Turner-Scott Motorsports teammate Nelson Piquet Jr. laid down the base line test laps for NASCAR to share information with the teams, Buescher was there to view the track and watch his teammate. Steckly (No. 22 Canadian Tire Dodge) is the current points leader, leading D.J. Kennington by four points following Antoginish. Steckly has never won at CTMP, though had a career-best of third last year and has four top-fives in seven starts on the road course. Chad Hackenbracht will be driving the No. 27 Jacombs Motorsports car as a teammate to series rookie Alex Gunette. Hackenbracht will be making his first career Canadian Tire Series start this weekend in anticipation for his third NASCAR Camping World Truck Series start. Like Dillon, Hackenbracht has some road course experience virtue of his time spent in ARCA. Speaking of Gunette, he will be driving the No. 39 Motos Illimitées/DLGL Dodge as he looks to break the tie for first between himself and Ryley Seibert in the rookie standings. Gunette had a career best second place finish in his last series start at St. Eustache, Quebec. He didn’t fair too well in May at CTMP as he finished 27th. Lastly, Jeb Burton will be driving the No. 7 State Water Heaters Dodge as he looks to make his first carer Canadian Tire Series start as well. Burton has stuck to ovals for his career so this will mark the first time the son of Ward Burton has found himself on a road course. However, he has proven to be quick at adapting to new situations in his rookie season with a win, three top fives and seven top 10s in 13 starts this year. The No. 7 State Water Heaters Dodge is normally piloted by Pete Shepherd. Shepherd has run a limited schedule the past five years due to lack of funding to run the full schedule. However, Shepherd has been really successful. In the two races that Shepherd has run this year at Delaware and CTMP’s oval, Shepherd won both of them. No pressure for Burton, right? Looking at the caliber of rides that these four drivers are running, it will be interesting to see how much the added track time helps them, as well as whether one of them can beat one of the series regulars for the win. With Fitzpatrick, Steckly and Gunette in the field (as mentioned above), plus series regulars that include D.J. Kennington, Andrew Ranger, Kerry Micks and Jeff Lapcevich, you can promise that it will be exciting.